After release from prison, the Costa Rican man must be turned over to immigration officials for removal proceedings. 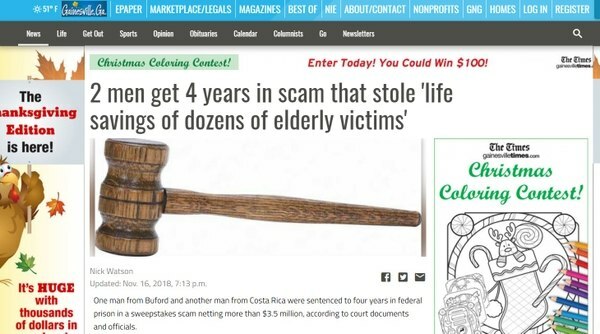 The Costa Rican, Rodolfo Orozco Aguilar, 44, was sentenced to four years in a U.S. federal prison in a sweepstakes scam netting more than US$3.5 million, according to court documents and officials. 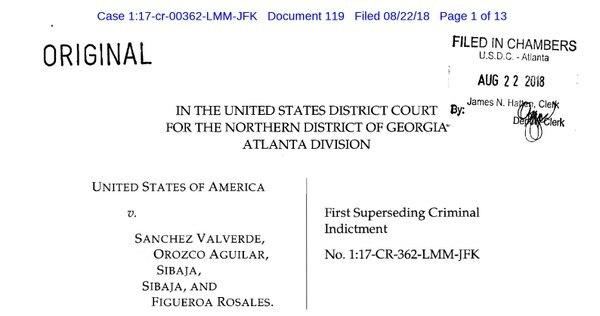 Orozco Aguilar and co-defendant Daniel Sibaja, 28, of Buford, Georgia pleaded guilty to commit mail fraud. Their co-defendants — Elpelice Figueroa Rosales, 62, and Silvia Sanchez Valverde, 47, also of Buford, pleaded guilty to one count each of conspiracy to commit mail fraud, but sentencing has not yet taken place. A fifth co-defendant yet to be sentenced, Priscilla Sibaja, 21, of Buford, pleaded guilty to one count of conspiracy to commit money laundering, the Gainesville Times reported. According to the U.S. Attorney’s Office, between February 2016 and September 2017, dozens of victims were called and told they had won a sweepstakes or lottery. “The victims were told that they could receive their sweepstakes winnings after they paid various expenses, such as taxes and fees. The victims were directed to pay the expenses to various companies controlled by the defendants, such as J.G. Services, RF Financial Services, and Master Builders. The victims would then mail payments via personal and cashier’s checks to addresses that were linked to mailboxes rented by the defendants,” the U.S. Attorney’s Office wrote in a previous news release. “More than US$3.5 million was deposited into bank accounts before transferring the majority of the funds to Costa Rican bank accounts. These defendants stole the life savings of dozens of elderly victims and received more than $3.5 million,” said U.S. Attorney’s Office. After release, Aguilar must be turned over to immigration officials for removal proceedings. He will be on supervised release for one year. A restitution hearing has been set for January 28, 2019. In addition, the forfeiture provision upon conviction would apply to “all property constituting or derived from proceeds obtained directly or indirectly as a result of said violations,” which would include money in various bank accounts, smartphones, and laptop computers.